Meat is a piece of vitality. This slogan also applies in a transposed sense to REICH band saw machines. The larger the material thickness, the longer the service life of the machine. 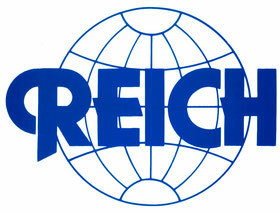 At REICH, you can expect a lifetime of 25 to 30 years. For this reason REICH uses an extra thick 3 mm stainless steel plate to manufacture the housing for all REICH band saw models. The table top of the band saws is made of 4 mm stainless steel plate. The machine bodies are completely welded. This results in a robust permanent machine structure. 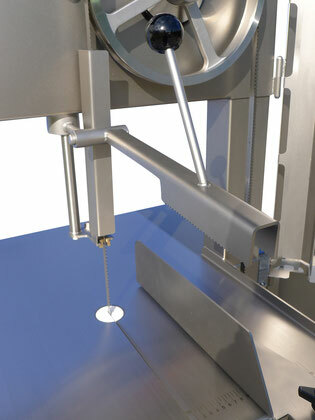 The table tops are continuously welded to the machine body and additionally supported by hygienically designed struts. As a result, the work piece as an important component of the band saw, is optimally prepared for the heaviest meat and bone parts. Due to this construction dense and hygienically perfect joints will last for the entire service life of the machine. The cleaning is therefore also possible with high-pressure cleaners since the weld seams are undestructable. by the precisely manufactured wheels. of the saw blade is guaranteed. which prevents the saw blade from slipping. Precise rustfree durable guides ensure precise cutting performance. which leads to a higher working safety and also to a constant disc thickness. 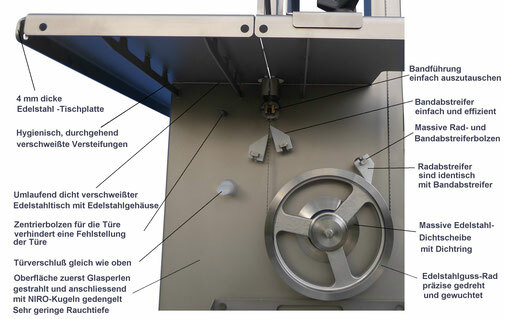 The disc thickness is set by a stable portion gauge. A length scale in centimeters makes it easy to adjust the thickness of the portion. a removable material presser as standard. or bone pieces can be safely sawn through. The hands are as far as possible apart from the danger spot. 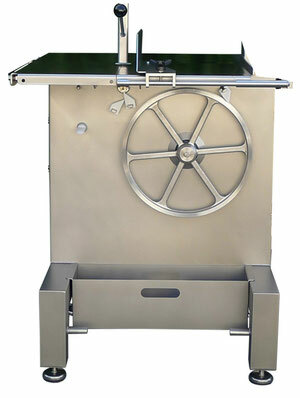 For sawing large pieces of meat and bone the material pusher can be removed with a handgrip. A clean cut pattern is provided by wheel and belt wipers made of low-wear plastic and replaceable without tools. The blade guides can be replaced without using tools. Elaborate sealing units prevent the ingress of water into the engine compartment and in the bearings of the upper impeller. The bearings of the upper impeller built into the wheel hub, which provides for optimal force distribution on the bearings and thus leads to an above average service life of the ball bearings. The statutory electric brake is wear-free and therefore also maintenance-free. Alternatively we also equip the machines with a mechanical brake motor. With the mechanical brake motor very short braking times of 1-2 seconds are achieved. than an electronically braked motor. Special attention was paid to a simple solution to the electrical system. the control if a component is defective. All electrical components are commercially available from internationally renowned manufacturers. This ensures a worldwide spare parts service. The electrical device is submerged in the engine compartment in a waterproof housing. electrical switching contacts and ultimately contributes to trouble-free operation of the machine. By means of protective caps on the ON and OFF button, the highest possible degree of tightness is achieved with the electrical components. Despite the high-quality execution of all REICH band saws, these are extremely attractive and competitive. 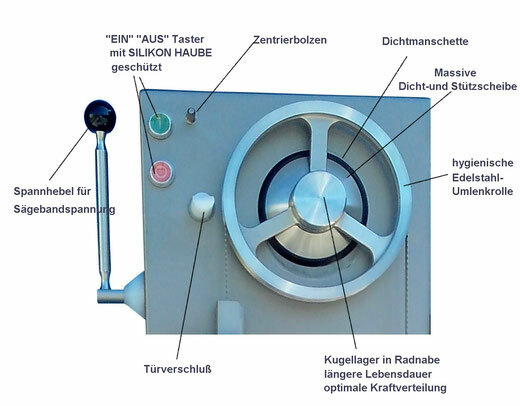 It is always worth to call REICH before the purchase of a new band saw (+497151 79899) or just send an email.